A high dose mix of nutrients that promote healthy joints, tendons and muscles formulated to meet the high requirements of professional sports people. B.FLEX is the only product that provides this high dosis of so many nutrients that are good for the mobility. 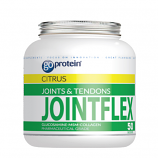 B.FLEX is used by Martin Johnson, Paula Radcliffe, Sonia O'Sullivan and many other top performers helping to keep their joints and tendons flexible and in the best possible condition even under the highest training load.